Traditional Home In Waterfall District - Now SOLAR-POWERED! E komo mai (welcome!) to this traditional 1940s Hawaiian home in Hilo, the cultural center of the island of Hawai’i. Here, your family or group can hang loose and absorb the spirit of aloha (the joyful sharing of life) while you explore the tropical side of our island, including the Hamakua Coast and Volcano National Park. The house is located just minutes from famous sites, including Rainbow Falls, Pe'epe'e Falls, the Boiling Pots rapids, and Kaumana Cave (an extinct lava tube). Outside, the expansive lanai is a vacation unto itself with views of Hilo to the east and Mauna Kea peeking above the jungle treetops to the west. The house rests on a lovely palm-fringed half acre, populated by geckos, mongooses, mynah birds and others. Let the song of tree frogs send you to sleep, and roosters rouse you for another exciting day. Enjoy preparing Hawaiian foods from Hilo's famous outdoor market in the spacious kitchen, while your keiki (children) play on the lanai, ping-pong downstairs, or explore the jungly yard. Inside, the main living space is on the second floor, inviting gentle trade winds to flow throughout. Four bedrooms and two full baths, eat-in kitchen, and spacious living room provide accommodations for up to 10 people. The house is stocked with linens, and beach towels, as well as games, and books about Hawaiian topics (including travel, children’s books, novels, and local cookbooks) for your enjoyment. Downstairs is an enormous rumpus room with ping pong table and a Hawaiian motif stone mosaic floor that is original to the house. Also downstairs is an additional half bath, laundry facilities, and an outdoor shower for rinsing after the beach. In Hawaii, please expect visits from the ubiquitous friendly green geckos. 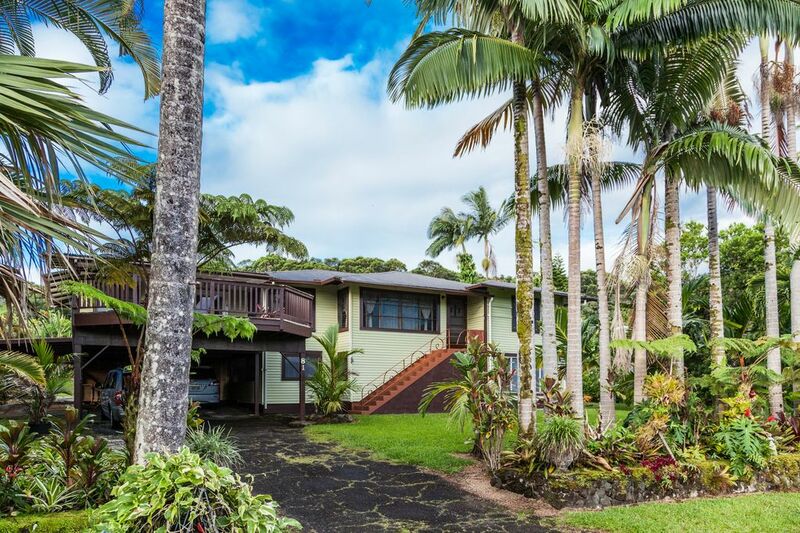 This property is conveniently located just 3 miles from downtown Hilo’s museums and restaurants and 4-5 miles from Hilo’s airport and best snorkeling, at Richardson’s Beach. Not to be missed is a trip to Mauna Kea’s Visitor Center for night stargazing (free, open until 10pm nightly), just 30 miles away. It is also an easy 25-mile drive for a convenient day trip to Volcano National Park. On another day, take a leisurely drive north on the Hamakua Coast to visit the amazing Hawaii Tropical Botanical Garden (9 miles), or the historic sugar industry towns of Honomu (13 miles) and Honoka’a (43 miles). Take the Saddle Road across the island’s center 75 miles to reach Kona’s airport and beaches beyond. Our family of three has roots in Cuba, and we deeply appreciate the welcome we have received in our adopted island home of Hawai’i. This house is perfect if you want to avoid the tourist crowds, soak up the laid back Hawaiian lifestyle, meet island creatures up close and personal, and explore the windward side of Hawaii Island and Volcanoes National Park. We have provided Hawai'i travel guides, novels and children's books set in Hawaii, as well as a collection of local cookbooks. Why not try a Hawaiian recipe using locally grown taro, lychee or papaya? For ingredients, visit the famous farmer's market in downtown Hilo any day. Full market days (with crafts in addition to foods) are Wednesdays and Saturdays. The two upstairs bathroom were recently completely renovated by local artisans who made the new vanities by hand from local tropical woods. Looking north from the spacious lanai, you can see towering Mauna Kea at its impressive 13,800 feet. At nearly 800 feet elevation, the home offers a lovely view of the Hilo coastline on the horizon. Both the washer and dryer are located in the spacious, downstairs laundry area. There is ample, off street parking. A carport attached to house will cover two visiting cars. The incredible lanai has a covered dining area is a great place to dine on the beautiful, teak dining table. Inside, the kitchen has counter seating for 3-4 and the living room has a table for 4. A flat screen television is available in the living area. Basic cable is provided, and you can connect to your hulu and netflix accounts. Variety of travel books, novels, children's books, and cook books with local themes. The rumpus room is located in the downstairs portion of the house. There is a ton of space to place ping pong or exercise. We have provided several fun board games for you to enjoy. Many family DVDs are in the cabinet beneath the TV. Walk throughout the lush yard. The fabulous, upper deck is partially covered. It offers two comfortable lounge chairs as well as a covered area with teak dining table. In 2018, we installed a state-of-the art solar electricity system to conserve resources and preserve the natural beauty of Hawai'i. However, if needed, the system will draw power from the grid to provided our guests uninterrupted electric service. The house sits at a very comfortable elevation (about 800 feet ASL). Like most traditional houses in this area there is no air conditioning or heating because the temperatures are almost always between 65-85 degrees F. Ceiling fans provide cooling. Great house. Quiet safe neighborhood. Everything we needed and more. Would definitely recommend to friends and family. 5 adults stayed in this comfortable, open-design home and really enjoyed it. The kitchen is huge and has room for multiple cooks without getting in each other’s way. We dined outside at the covered dinner table each time we ate in. The ground floor is equally large, but all unfinished. In the end that didn’t matter, upstairs was more than enough space for our group. And mattresses were firm, so sleeping was comfortable. The addition of a gas grill would make the porch a perfect space (small hibachi grills there now are more work than they’re worth). Clean and comfortable. We loved the deck. Good location to explore Hilo from and surrounding area. We’d stay here again. spacious home, fun for kids, easy access to hilo, volcano park, etc. 3 week trip with 4 different accommodations. So, I had the chance to compare. The house is spacious and clean. The beds are very comfortable and we enjoyed the experience of living in a typical Hawaiian neighborhood and home. We loved the balcony and the spacious kitchen. Although the house is not air conditioned, there is always a breeze and we did not suffer from the heat. To have visited 3 other houses, I would like to make you the suggestion to be a little more generous with the articles of toilets, of households and the objects of beaches. For a stay of 6 nights 4 people, we would appreciate having more than bottoms of bottles (soap, dish soap, ...). In the other accommodations, we also enjoy having body boards and a large cooler. That said, thanks to Steve and Ashley for their welcome and their quick responses to my emails. I recommend this house for a beautiful Hawaiian vacation. The Island of Hawaii has so much to see and do! If you love beaches, we have a black sand beach nearby, and even a fabulous green sand beach on the island. Want a change of pace? Hawaii Volcanoes National Park is a short 30 minute drive away. There you can explore the fabulous Visitor Center, Art Gallery, lava tubes or possibly take a nice hike. There are short 15 minute hikes or if you are feeling even more adventurous, take an overnight hike throughout this incredible national park. Yes, great surfing and stand up paddle boarding are popular local hobbies as well. Boards and snorkel equipment can be rented at several local shops. RESERVATIONS FOR THE WEEK OF THE MERRIE MONARCH FESTIVAL ARE SUBJECT TO A 120 DAY CANCELLATION POLICY. NO REFUNDS WILL BE GIVEN WITHIN 120 DAYS OF THE FESTIVAL.